September saw us cross a pretty milestone of $500k net worth and while October didn't have anything significant happen we were able to build on our net worth thanks to both a rising market and being back to positive cash flow. 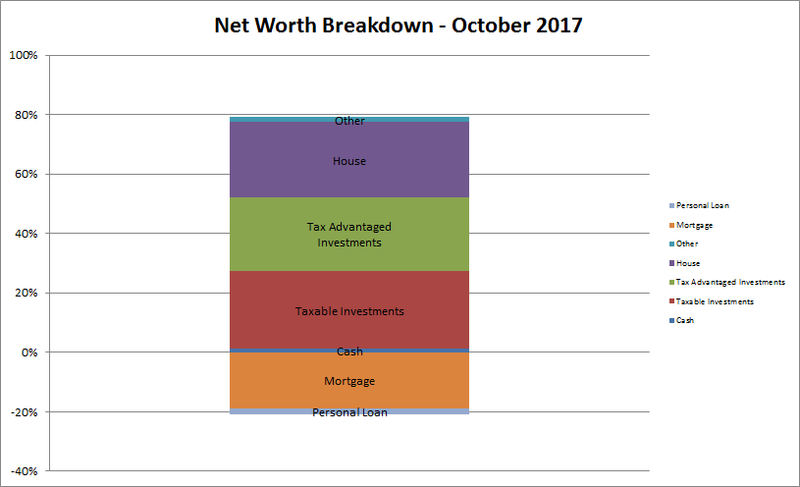 During October our net worth increased $4,345.41. 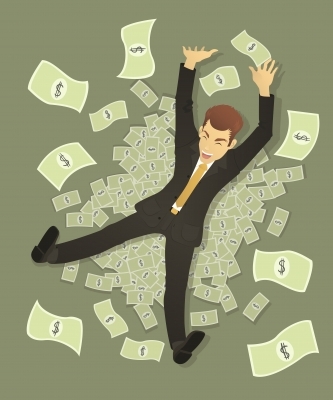 We had stalled out over the last few years with being proactive on building our net worth but that was largely due to "life" getting in the way. My wife had to quit her job while we dealt with all of the issues with our son, then I was laid off, then she got a new job while I stayed home with our daughter and then finally we returned back to a two income family earlier this year. Considering all that's happened over the last 3 years I can't really complain about where we're at now. The bull market is nearing a decade long run which has definitely helped to move our net worth higher these last couple years. That's the power of compounding and time. The savings/deferred spending from years prior allowed our investments to keep working even if one or both of us weren't. At this time I don't see much reason in paying extra on the mortgage given our relatively low interest rate as well as the tax break on mortgage payments and think we'll come out much further ahead investing the extra cash flow. So the liabilities side of the net worth equation will be slow moving. However, once the FI portfolio is able to get to a self-sustaining level of dividends then the plan is to aggressively pay down the mortgage. 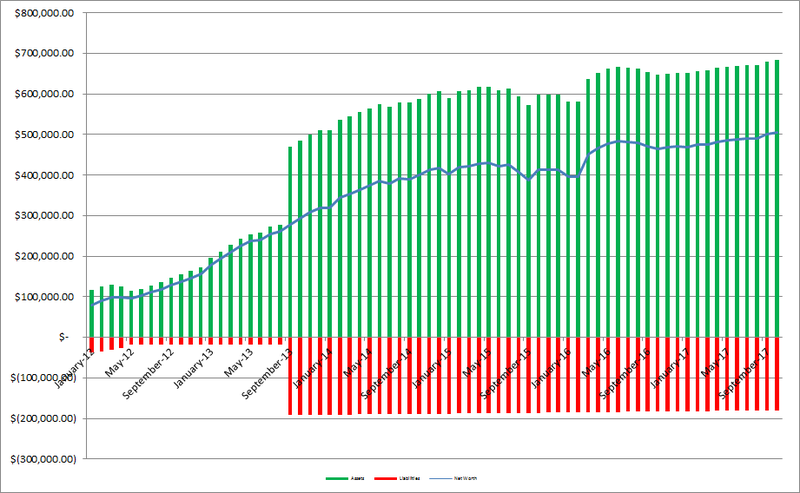 As of the end of October we have 25.4% equity in our house based on our purchase price from 2013. However, according to Zillow our house has increased in value around $33k from our purchase price which is a nice bonus, although I keep the purchase price as the value in the net worth equations. Based on Zillow's estimate the equity in our house is 35.4% thanks to the appreciation. 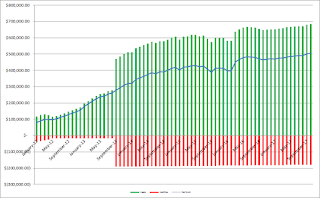 I've started including a % breakdown of our net worth with each monthly update. The assets are broken down into cash, taxable investments, tax advantaged investments (401k, Traditional & Roth IRAs), house (using our purchase price) and other which covers things like our cars and various collectibles from when I was a kid (they don't really move the needle at all). The liabilities are much simpler and fall into either the mortgage or a personal loan that we have. Although I do need to gather more information on the various medical, funeral and other debts that total around $40k to give a more accurate representation of our liabilities. Since I write so much about investigating companies as an investment I figured it'd be fun to see how our balance sheet looks. As of the end of October our debt to equity ratio is 36% and our debt to total capitalization is 21%. Not bad, but I'd love to get that debt down to ZERO! Truly passive income, dividends and interest, totaled $257.70 during October which was ever so slightly higher than July. *Dividends are from my taxable accounts only. My writing/blogging has been slow to come back, although that's due to having trainees with me for most of the day which means I have to show them the "by the book" way to do the job and teach them. So total non-day job income for October was just $257.70. Is your net worth riding the bull market wave to new heights? It looks like a decent increase and you're back into making some progress. Congrats on passing that 500k milestone. Wow. That is great progress right there. That's what I'm talking about right there. I'm excited to see how fast you will cross the seven figure mark. Congrats on the $500K milestone... it takes plenty of hard work to achieve such heights. Nice diversification in the taxable and tax-advantaged account amounts. If you can keep that ratio intact over time you should have tremendous flexibility in minimizing income tax once you stop working. Keep up the efforts! A sweet half a mill! Gogogogogogo! Congrats mate! 500k is awesome.